Registration: Will take place at the February, March, and April Roundtables or online. At that time we will need your pack number, contact information, number of scouts and dens, and number of adult members. Campsites will be assigned and Packs notified of their assignments in April. Registration will be on a first come first served basis and may need to be limited to maintain safe operation at Broad Creek. Final payment (in the form of a Unit Check) and 3 copies of your final Pack Roster need to be turned into the Dining Hall between 6pm – 9pm on Friday May 3. Even if you have registered online I will still need a final draft of your pack roster. Parking Considerations: There is limited parking at Camp Oest. We ask that each pack carpool as much as possible. Participants will need to plan to stay for the entire weekend. We will have parking attendants at the parking lot and ask that you park where directed to. We will require you to park in closely. We have noticed in past years that people leave too much space between vehicles and end up wasting parking space. We will provide a car registration to be displayed in your front windshield so that we can contact you if your car needs to be moved. If you do not already have this done before arrival, the Parking Attendant will require you to fill out the form. Also there will be absolutely NO parking down by the administration buildings. Please let your den parents know this. If a vehicle is in this area, and I cannot contact the owner, I will have it towed at the owner’s expense. Also, please note that I will allow ONLY TWO cars PER PACK to be designated as the Grubmaster and Quarter master to drive to the site to drop off camp food and gear. Please discuss this with your packs/dens so they are aware that they have to PACK their gear down to the site, or provide it to the quartermaster beforehand. Volunteer Staff and Judges: We are requesting that each Pack provide at least two adults to help run the stations in the morning. Also, if you have any siblings 13 and older that would like to volunteer, then please register them with your pack at the Roundtable. If they need documentation of service hours, then let the Program Director know. 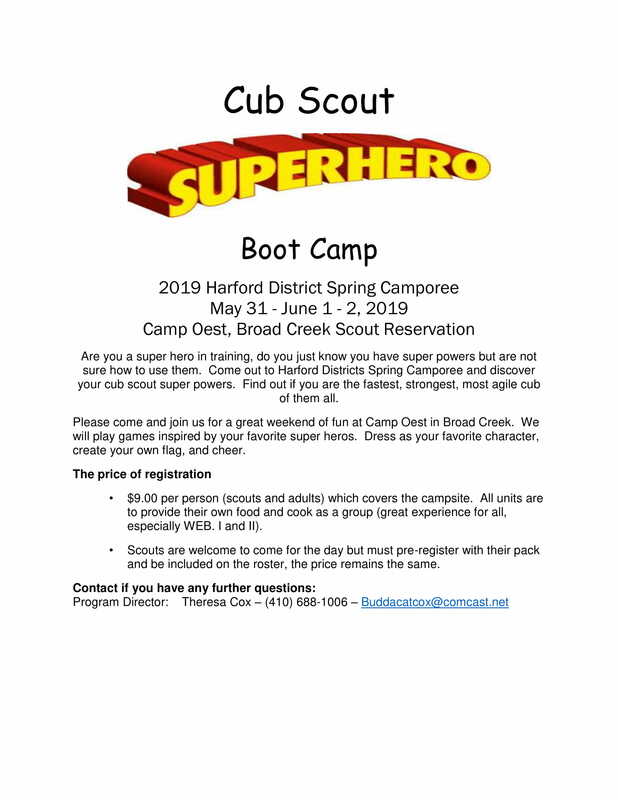 Troops Who Attend: We are asking for any Boy Scout Troops to join us to help run the camporee stations and do other tasks. If your Unit is able to attend, then please register at Roundtable. In the past years we’ve had Harford District Troops join us and as a result, the stations were mostly Boy Scout-Ran. This is a great way for scouts to get service hours, teach and help younger scouts, and all while having a good time. This is a really great thing to see! Any Unit that is volunteering as staff must pay the camp fee and check in at camp and cook as a unit.